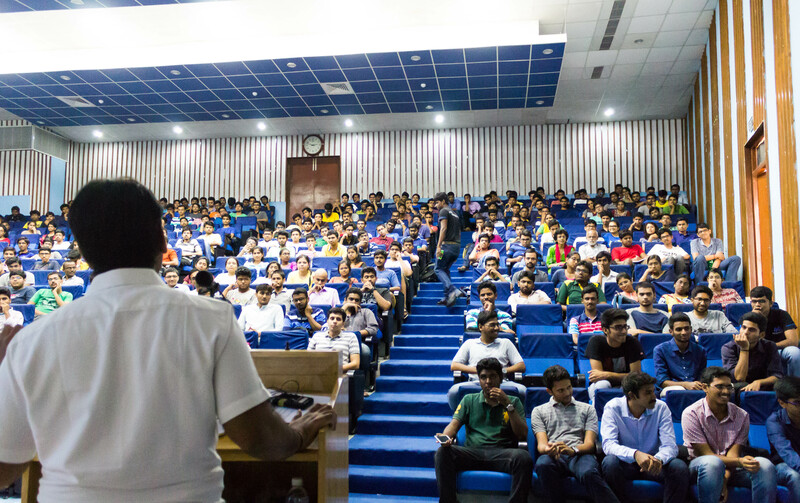 13th of August was a special day for Quoraholics and budding Entrepreneurs as Shaastra 2017 started off with a pre-Shaastra Spotlight lecture by the renowned Balaji Viswanathan, a popular writer on Quora. 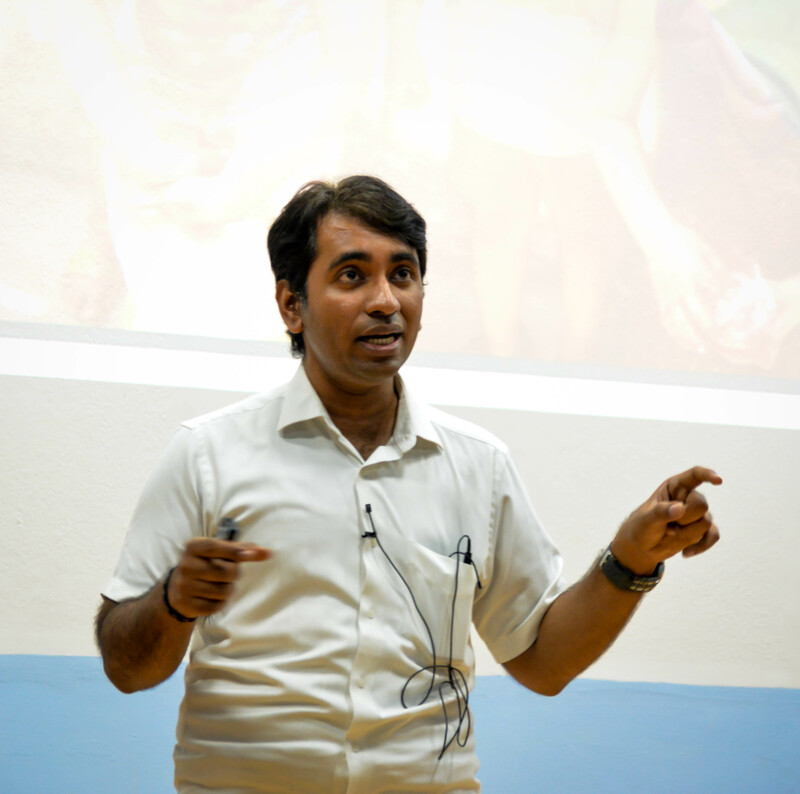 The first thirty minutes of the talk were given by Mr. Awdesh Singh, an IRS officer currently posted in Puducherry. Mr. Awdhesh Singh shared his views on spiritual intelligence and leadership with a focus on how to attain happiness in an imperfect world. The talk was centered around two themes: doing good for self-improvement as opposed to benefiting others; and the fact that our misery is, most of the time, self-made and borne from our constant search for perfection. Saying that perfection is impossible to attain, Mr. Singh also expressed his views on the GST bill and how taxation will change after its implementation. Mr. Balaji Viswanathan joined the students of IIT Madras by the time Mr. Awdesh was finished up answering students’ queries. Mr. Viswanathan was received by thunderous applause and seemed to be just as happy as the audience to be there. Mr. Balaji’s talk was on the Maker revolution and its potential for India. 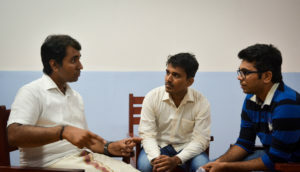 He talked about suicides that happen in India due to, in his opinion, the lack of a good educational system and how maker education can change the scenario of the Indian educational system. He also pointed out that the youth form the largest demographic in India and that their potential must be harnessed. India’s skill requirements must also change in keeping with the move from the informational age (marked by analysis and reasoning) to the conceptual age (marked by the dominance of creation, metacognition and self-actualisation). Students can be motivated by challenges and getting to learn the practical aspects of any concept and not just the theory. In his own words, the maker revolution is important because we need a scalable model that can prepare all Indians for the conceptual age. You can find his presentation slides here. The presentation was followed by an interactive session with the audience where a variety of questions was asked. We reproduce part of this session below. What are your takeaways from your previous startup experience? As far as my previous startups are concerned, there are two points: the first being my understanding of when to scale: it is important to know the model fully and only then scale. The second was knowing when to quit. Can we define the right scale up time? While this metric cannot be rightly defined, it is important to have a working model in two weeks. The model can be improved based on customer satisfaction but a basic working model must be in place as soon as possible. Think and Grow Rich by Napoleon Hall and Y Combinator blog written by Paul Graham. Do you think the reason many startups in India fail is because the startup bubble is bursting or due to lack of quality? The Indian startup scenario is highly competitive with more than one startup working on a similar idea. A few are destined to fail. However, this is no way an indicator of the startup ecosystem in India. You talked to about changing the education system which is going to be a difficult task. Why don’t we inculcate adaptability (or a curriculum that teaches the student how to be adaptive)? It will add to a lot of stress. 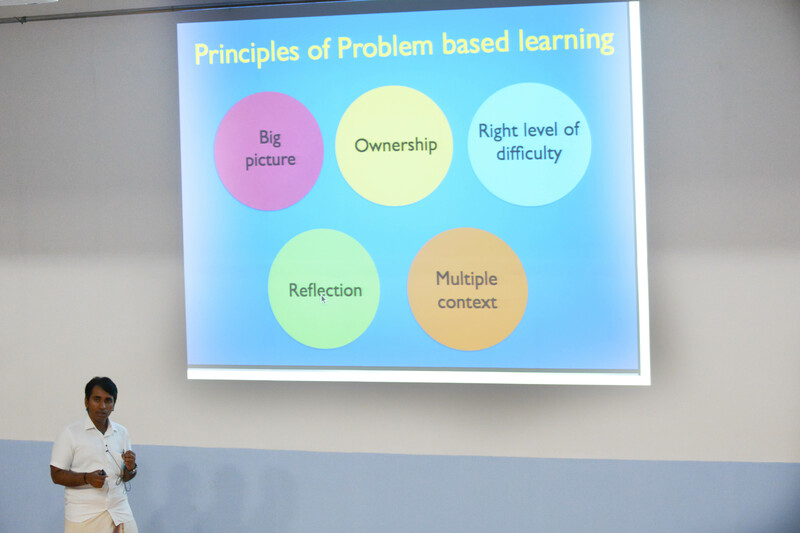 Your talk focused on changing the curriculum at primary school level. What is the methodology that you would suggest for schools and colleges? Set up parallel systems and create a culture and the system will automatically change. Can the maker culture sustain if costs go up due to the Chinese economy slowing down? The market is right now in such a way that someone else will do it cheaper. What do you think is the right motto for a startup: go learn or focus on talent acquisition? It is the same old chicken or egg question. If you are doing interesting stuff, people will automatically want to join and work with you. However while one person doing all work is difficult, having three would mean that there may be excessive discussions for every decision. Two is the right number, in that case. Do you feel that work experience helps before branching out on a startup? It is helpful but in today’s conceptual age, it’s no longer relevant. Previously, work experience used to help in building contacts and in raising startup capital. Now we have a healthy setup for both which makes work experience moot. What do you think about MBAs? What are your thoughts on an MBA in India vs an MBA in US? An MBA prepares you for a spread career. While IITs have international reach, IIMs have only national visibility. So if you want to work in Indian companies, go for IIMs, otherwise an MBA in the US has a better brand value. Do you think this “Jugaad” based culture is right?. None of these “jugaad” based startups like Flipkart or Ola seem to survive against strong competition from their counterparts like Amazon or Uber. I think that “Jugaad” based culture is right in its own sense. Talking about Flipkart or Ola, they have survived very well considering how strong their counterparts are. Amazon.in came in quite late and Uber had some of its own issues which allowed Ola to gain the fame. Post the audience Interaction, T5E got an opportunity to conduct a brief Interview with Mr. Balaji Viswanathan. The excerpts of the interview are published below. Despite being one of the educational and industrial hubs, Chennai has missed the bus on the IT revolution and now the startup revolution. Why do you think this happened? There are two key elements of a startup ecosystem: one, having the talent pool; and two, being open to new ideas. Chennai, like Boston, has a large talent pool, but lacks in tolerance and acceptance to new ideas. Bangalore and Bombay for that matter, have a very open and tolerant society. As a city, we must be welcoming of not only other languages and ideas, but anything which might be different from the establishment as well. Until this is fixed, I feel it is going to hinder Chennai from latching onto other revolutions as well. I love Chennai, but I would not think of starting up in Chennai until it becomes more pluralistic and accepts things which go against the norm. Poverty and corruption are said to be directly proportional to each other. India, defying this trend, has shown a drop in poverty and increase in corruption. I would say, corruption is also coming down. Twenty years ago, you had to bribe someone to get a phone, get a phone line, passports, scooter etc.. I think we are getting much more cleaner, even though a lot of big-ticket scams are getting exposed. What are your thoughts on Kiran Bedi’s policies in Pondicherry? I am not much familiar with her exact work in Pondicherry, but Kiran Bedi is a person who ‘hacks’ the system, thanks to her agile and progressive mindset. She doesn’t take things as they are and tries to change them for the better. That is something I really admire about her. Do you think our bureaucracy is in order if India has to become a superpower? We need to start empowering our bureaucrats as well as hold them responsible. They should have the power to hire and fire people as they deem fit to get work done at much faster rates. The really smart will rise up in such a system. How do we solve the ‘not-my-problem’ attitude in government sector and inculcate accountability in it? It has to be much more decentralised and localised. A lot of things in the US are solved by local bodies like town halls and city bodies. More than that, we as the public need to take a more active role in governance. If somebody puts up a shop on the pedestrian path, the twenty people getting affected by it would protest in the USA. If you are complaining, your intent must be strong enough to change the system. We must push our politicians towards the attitude of ‘getting things done’ to make things better. India has missed the bus on several revolutions. How do we hop on the bandwagon? We must get into next-gen manufacturing, not just the old-age manufacturing industries. We must leverage our strength in IT to make it possible. We could get into robotics, 3D printing and augmented reality, just as we tried our hands at space technology and succeeded hugely. So, innovation must be thrust upon, along with giving it a direction which generates employment. As a follow up to this question, the burgeoning middle class in India has a bias against manufacturing jobs. How can we change that? So, it is more like ‘pulling from the end’. If it is about the culture of the people, we cannot go and lecture anybody to change them. Instead, what we can do is build such makerspaces and also provide them with lucrative career opportunities through it. The best and worst thing about the middle class is that they copy whatever gets them more money. We need to use this behavioural aspect to our advantage and get a better turnaround at a macro-level. You said that we have to start pulling people from the agricultural sector. But, it is the top money-making sector in India. How much percentage of people are there in agricultural sector? 60% of people producing 14% of GDP is really a bad deal. If 10 farmers own 20 acres of land, each one of them will be poor. But the total revenue might even increase if just 1 farmer is given the entire 20 acres of land, due to economies of scale. How do we employ the remaining 9 people now? That’s where manufacturing comes into play. Other countries have a much much higher farm productivity and we must depopulate our farms. For a democracy to function soundly, the role of the opposition is very important. With the gradual decline of the Congress across states and in the centre, do you think it will be detrimental to the federal system? They are still able to block bills in the Rajya Sabha because we have two chambers and the government is not in a position to make any changes in the constitution. There is still a good balance of power, which was not in the case of Rajiv Gandhi’s government. There is too much of balance, I would say. How would you rate the current government and where can it improve? They are good in vision, but for good execution, they need a much better talent pool of ministers under Modi. Modi is like Sachin Tendulkar in the 90s, he needs the support of his ministers. Right now, he himself has to look over the functioning of secretaries. He should be able to delegate work to his ministers. For well over two hours, Mr. Balaji Viswanathan patiently answered a plethora of diverse questions. His enthusiasm and passion are sure to leave a lasting impression on the students who attended his talk. The Shaastra pre-lecture series could not have gotten a better start!